You can convert preferred securities into common stock. 1. How do I Convert Preferred Stocks to Common Stocks? Preferred stocks provide investors with many of the benefits associated with both bonds and common stock. On the downside, you also expose yourself to some of the dangers related to equities and debt instruments. Preferred stocks are sensitive to rising interest rates. However, rising rates aren't necessarily bad news for preferred stockholders. 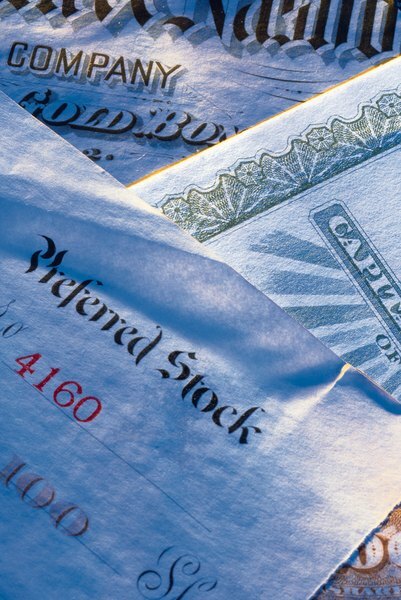 When you buy preferred stock, you gain an ownership stake in a company. Preferred stockholders hold seniority over common stockholders. If the stock issuer goes bankrupt, financial claims from preferred stockholders are addressed before common stockholders get any money. However, bondholders and creditors have priority over preferred stockholders. Companies pay fixed dividends to preferred stockholders. The steady income stream means preferred stocks are less susceptible to price fluctuations than common stocks, which often pay no dividends at all. Convertible preferred stocks are simply stocks that you can convert into common stock at some point. The details of the purchase agreement dictate the timing and terms of the conversion. Governments raise interest rates to curb inflation. As borrowing costs rise, consumers and businesses curtail spending because they need extra cash to cover debt-related expenses. Therefore, rising interest rates are synonymous with inflation, and inflation spells trouble for preferred stockholders. Preferred stocks pay a flat dividend, which means your dividend income remains steady while inflation causes prices to rise. Consequently, your spending power decreases. You can address this issue by selling your preferred stock. However, you may struggle to find a buyer, as other investors can readily access newer preferred securities with higher yields. You can tackle inflation-related problems by converting your preferred stock into common stock. The stock market sometimes rises along with interest rates as investors funnel their money into stocks in search of returns that outpace inflation. If your conversion is based on a predetermined exchange rate, you make immediate gains because you acquire the common stock at a discounted price. On the other hand, some conversions are based on the dollar amount being converted rather than the actual stock price. If you convert $10,000 into common stock, you get fewer stocks if the price is $15 per stock as opposed to $10 per stock. Preferred stocks often have a call feature. This enables the company that issued the stock to call it in and convert it into common stock. When interest rates are falling, companies refinance debt to reduce costs. In the same way, a company may call in high-yield preferred stock and reissue new stock that pays a lower dividend. In a rising-rate environment, the stock issuer stands to gain nothing by activating the call feature. Therefore, rising interest rates are good news if you want to hold onto your preferred stock. Forbes: Do Preferred Stocks Deserve a Place in Your Portfolio?